Hypoadrenocorticism (Addison’s disease) is a hormonal disorder named after Thomas Addison, a British scientist, who is credited for being the first person to demonstrate that adrenal glands are necessary for life. Dogs, cats, humans and other species have a pair of small glands located in the abdomen, one next to each kidney. In Latin, “kidney” is “renal” and “next to” is “ad.” These small glands are therefore called the adrenal glands because of their location. They are so named because they were recognized by anatomists long before their vital (lifesaving) function was understood. The glands produce two substances, glucocorticoids and mineralocorticoids that are critical for life. After they have been synthesized, these substances are secreted into the blood stream and circulate throughout the body. As such, they are classified as being hormones. Both of these hormones have an effect on the function of cells everywhere in the body. To look at it another way, cells everywhere in the body need some glucocorticoids and some mineralocorticoids to be healthy. They suffer if there is too much or too little of either or both. Addison’s disease occurs when the body contains too little glucocorticoid or too little mineralocorticoid, or both. Glucocorticoids are natural cortisone, which is necessary for life and important in ensuring that individuals feel well. Glucocorticoids have many functions, including an effect on appetite and immune system function. Doctors commonly use both natural and synthetic cortisones because they can be beneficial as a medical treatment for relatively minor problems (e.g. poison oak) and for serious life-threatening medical disorders (e.g. some cancers). If an individual chronically has too much or too little cortisone in his or her system, serious medical problems can result. Too little cortisone is one of two components of Addison’s disease. Mineralocorticoids are another vital substance produced by normal adrenal glands. They control two of the body’s critically important “salt” concentrations, the levels of both sodium and potassium. As with glucocorticoids, too much mineralocorticoid in the system usually results in serious medical problems. Too little mineralocorticoid is a life-threatening condition. The onset of Addison’s disease is usually the result of some destructive process affecting both adrenal glands and the cells that produce both of these critically important hormones. The most common cause of Addison’s disease is destruction of both adrenal glands by the individual’s own immune system. The immune system functions primarily by constantly being on the lookout for foreign objects. Upon seeing something not recognized as “self,” this system immediately tries to kill whatever that might be. The best examples of foreign bodies that the immune system wants to kill are bacteria and viruses. For reasons that are not well understood, the immune system occasionally sees normal body parts as “foreign” and sets out to kill these tissues. In this uncommon instance, the immune system sees the adrenal glands as foreign and kills these cells. Less common causes of Addison’s disease are cancers or infections that can invade and kill the adrenal glands. Considered rare in cats, Addison’s disease is relatively uncommon in dogs. When seen, it is most prevalent in young to middle-aged female dogs. 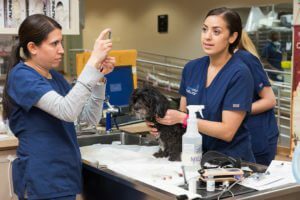 The condition has, however, been diagnosed in dogs and cats of all ages, either gender, and in both intact and neutered animals, and certain dog breeds may be predisposed to the disease. A less common observation is intermittent weakness or loss of appetite. Some dogs have been observed to shiver, tremble or shake as if they are cold. Others may suddenly collapse and quickly seem to develop a shock-like condition. Vomiting, diarrhea, loss of appetite and weight loss are extremely nonspecific problems. These can be the symptoms of a dog or cat that has stomach, intestinal, heart, liver or kidney disease. Other conditions can also cause these types of symptoms. To further complicate this issue, diseases of other organ systems are much more common than Addison’s disease. Therefore your veterinarian may or may not suspect Addison’s disease after talking with you and completing a physical examination. 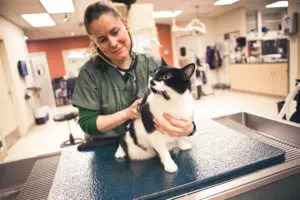 It is most likely that your veterinarian will believe that your pet is ill and will recommend a battery of tests that will assess various organ systems simultaneously. One of the hallmark abnormalities seen in dogs with Addison’s disease is an increase in blood concentrations of potassium and decreases in blood concentrations of sodium. However, such changes are also nonspecific. If Addison’s disease is suspected, the ACTH stimulation test is the “gold standard” for diagnosis. If the result is typical of Addison’s disease, your pet will require life-long treatment for survival. Long-term treatment of Addison’s is not nearly as difficult as making the diagnosis in the first place. Further, long-term treatment is not nearly as difficult as the intensive care that may be required initially if a patient is in a severe, life threatening condition. There are both glucocorticoids and mineralocorticoid replacement medications. The glucocorticoids used in the treatment of Addison’s disease are not special in any way. Rather, these are the same medications used for a variety of conditions in both human and veterinary medicine. The only unique aspect regarding glucocorticoid replacement therapy for Addison’s disease is the fact that affected pets require relatively tiny doses as compared with the doses used for pets with immune-mediated disease, cancer or other conditions. Two different mineralocorticoids are available. Both of these medications are specific for patients with Addison’s disease. The pill form is commonly used in people and is effective at low doses; however, dogs and cats seem relatively resistant to the pills. Instead, there is an injectable medication made specifically for dogs and cats that is used once every 25-days. This drug is effective and is the recommended mineralocorticoid. Some dogs require injections every 21 days, and others can get by with one injection each month. Most, however, respond better with injections every 25 days. Owners can usually administer these injections. It may take two to six months to establish a dose, but once the correct dose is determined, it will remain relatively constant. Addison’s disease is a relatively uncommon syndrome. Dogs and cats correctly diagnosed and properly treated live healthy and happy lives.